1908 was a break it or make it year for the Ottoman Empire, which was on the brink of collapse. Its interrupted process of modernizations was to be resumed. The process of internal reform initiated with the imperial edicts of 1839 and 1856 led to the promulgation of the Constitution of 1876, which ushered the First Constitutional Era. Sultan Abdul Hamid II (1876-1908), who had sanctioned the Constitution, suspended it in 1878 and launched his thirty-year long tyrannical rule. The conservative politics of Abdul Hamid went against the current of social reform and more liberal environment. His tightened rule dismissed all claims by minorities. His repressive policies peaked with the massacre of Armenians in 1894-1896, which cost the life of some 300,000 people. The Committee of Union and Progress (CUP), an underground organization founded in 1889, functioned as an umbrella party for the movement of the Young Turks, which sought to end with the rule of Abdul Hamid and to prevent the collapse of the empire. To this goal, they looked forward to an alliance with the revolutionary forces that functioned within the ethnic minorities, including the Armenians, in two opposition congresses convened in 1902 and 1907. The Hunchakian party rejected to cooperate on the grounds that the CUP tried to impose its Ottomanist plan and leave aside any particular concern or demand from the minorities. 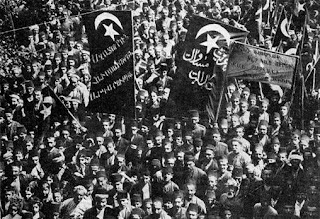 On the other hand, the Armenian Revolutionary Federation accepted the offer, considering a priority the overthrow of Abdul Hamid’s regime. Different methods of civil disobedience were anticipated, with an armed rebellion anticipated for October 1908. The CUP had moved its headquarters to Salonica (Thessalonika in Macedonia, now part of Greece) in 1906. Military officers gained to the cause of the Young Turks accelerated the revolt after a meeting of King Edward VII of England and Czar Nicholas II of Russia in the Baltic port of Reval (now Tallinn, the capital of Estonia) in June 1908. During the meeting, new reforms were drafted for the region of Macedonia, which in the end would be detached from the Ottoman Empire after the Balkan War of 1912. The fear that the meeting was a prologue to the separation of Macedonia led to the mutiny against the sultan, which was initiated by major Ahmed Niyazi on July 3 with a demand to restore the constitution. The movement spread rapidly throughout Macedonia. The attempt by Abdul Hamid to suppress the uprising failed, with the garrisons of Constantinople and Asia Minor being also favorable to the rebels. The sultan capitulated and on the night of July 23-24 the restoration of the Ottoman Constitution of 1876 was announced. Abdul Hamid II became a nominal ruler and the power went to the revolutionaries. Decrees establishing freedom of speech and press, and a general amnesty were soon issued. General elections were held in November and December 1908, and the CUP won a majority in the Parliament. The election was marred with fraud and threats in places where Armenian candidates were on the ballot. As a result, only 12 Armenian deputies were elected out of a total of 230. The Senate reconvened on December 17, 1908, and the Chamber of Deputies held its first session on January 30, 1909. Armenian hopes that the motto of “equality, fraternity, freedom, justice” carried by the revolution would turn into real change were soon dashed. In April 1909 Abdul Hamid attempted to seize his power back with promises to restore the sharia-based system and eliminate secular policies. He attracted the support of masses of theological students and clerics, as well as army units, which revolted on April 13, 1909. 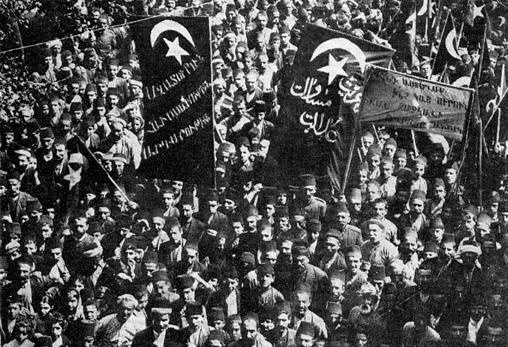 The Liberation Army coming from Macedonia and commanded by Mahmud Shevket Pasha restored the status quo and quashed the counterrevolutionary movement on April 24, 1909. However, in the meantime, the double massacre of Adana and surroundings, with its catastrophic sequel, was carried both by representatives of the “ancien regime” and the local Young Turks on April 13-15 and April 25-27, 1909, with an outcome of up to 30,000 Armenians, as well as Assyrians and Greeks massacred. The failure of the Ottoman government to prosecute and thoroughly punish the culprits of the massacre created profound disillusionment among Armenians. By 1910-1911 the revolutionary movement, caught in the conflict within the CUP among conservatives and liberals, was finished. The Libya war of 1911 and the Balkan War of 1912 essentially threw the empire out of Africa and Europe, and led to the coup d’état of January 1913 and the establishment of the government headed by the triumvirate of Talaat, Enver, and Jemal. World War I and the Armenian Genocide were not very far ahead.